This is a sponsored post in collaboration with Hunt’s Tomato Sauce and Latina Bloggers Connect. We thank you for supporting LatinoFoodie and the companies that make this blog possible. In our kitchen, many dishes call for the use of good quality tomatoes. Whether we are making frijoles, huevos rancheros, or arroz con pollo, the round red fruit is definitely the star. As the days grow shorter and the weather begins to cool, I crave hearty meals that will warm up the casita and feed our familia. 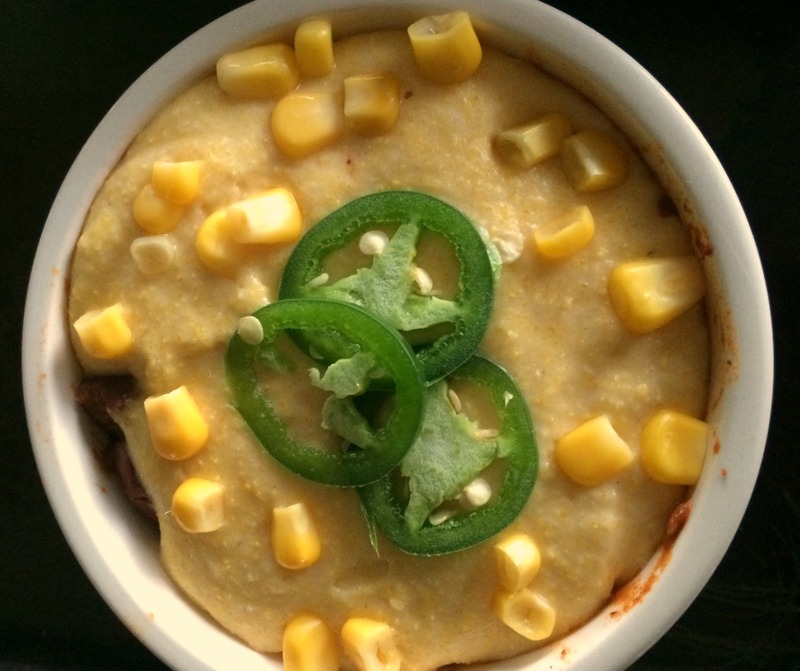 One of our favorite dishes in the fall is a chili bean casserole topped with a sweet and savory corn bread and cheddar cheese. 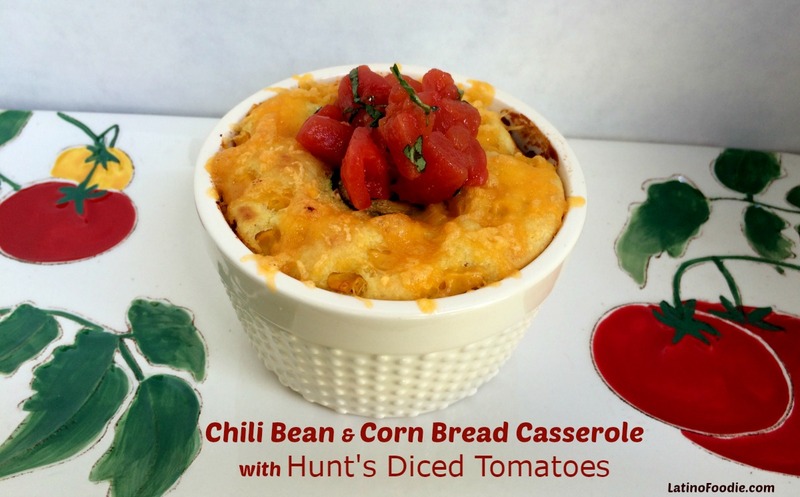 It has loads of tomatoes in it and I always use Hunt’s® diced tomatoes. 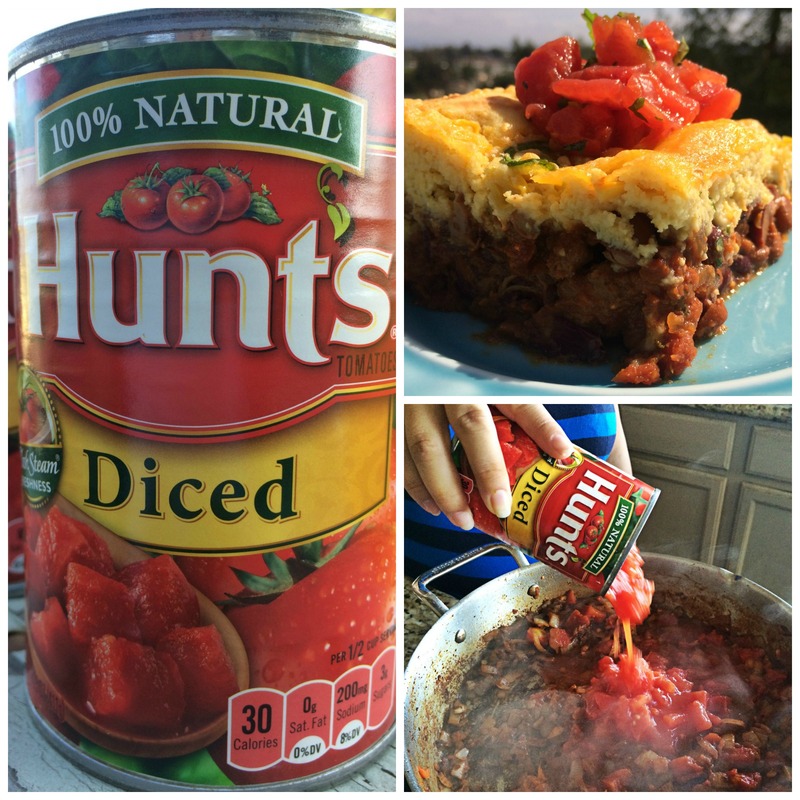 I also mix Hunt’s® diced tomatoes with chopped basil and olive oil to place on top of the casserole before serving. The sweet tomato mixture lifts this heavy dish with an element of freshness. 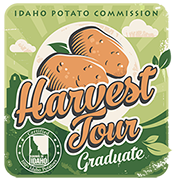 We recently learned that all of Hunt’s® tomatoes are grown in California and canned within hours of being picked. I remember hearing on one of my favorite radio cooking shows “Splendid Table” that canned tomatoes are actually sweeter than most off the vine as they are packed and canned at their maximum ripeness. As food bloggers, especially Latino food bloggers, it is important for us to cook with fresh, natural and quality ingredients. Of course, we love our freshly picked heirloom tomatoes from the Farmer’s Market, but for certain Latin dishes, they wouldn’t taste as good unless the tomatoes were from a can. And, you can’t go wrong with Hunt’s! If you are looking for new and modern recipes that include Hunt’s® products, look no further. Kraft® and Hunt’s® have 12 new recipes to create in your own kitchen. For more tips and recipe ideas, visit the Hunt’s® website or follow them on Facebook and Pinterest. Don’t you like our new tomato serving platter we found just for this blog post? Cute, right?!! (Depending on the size of your casserole dish, this recipe should yield enough chili beans for you to have some left over and freeze to enjoy another day). 1. Pat the beef cubes dry with paper towels. 2. Heat the oil in a very large heavy-bottomed pot and quickly brown the meat, in batches, on all sides. 3. Transfer the brisket to a separate bowl and set aside. 4. Sauté the onion and garlic in the same oil over medium heat until limp, but not brown, about 8 to 10 minutes. 5. Add the chili powder, pepper flakes, cayenne pepper and cumin and sauté for 1 minute. 6. Add the green peppers, jalapeño, bay leaf, tomatoes with their juice, the reserved meat, 1 tablespoon of salt and 1 teaspoon pepper and bring to a boil. 7. Reduce the heat, cover the pot with a tight fitting lid and simmer for 2 hours, stirring occasionally. 8. Taste and add salt to your preference. 9. Add the coffee, cover the pot and simmer for 1 more hour. 10. Add the kidney and pinto beans and basil. Mix well. 11. Lightly coat your baking dish with cooking spray. I used an 8” x 8” square baking dish with a 2 1/4 inch height. 12. Pour in your chili beans into baking dish, leaving about an inch on the top for the corn bread topping. 1. Whisk together flour, cornmeal, sugar, salt, and baking powder in a large bowl. 2. Whisk in buttermilk, eggs, and butter. 3. Stir in the corn and jalapeño. 4. Spoon mixture over top of filling, spreading almost to edges of pan. 5. Transfer to oven and bake until a tester inserted in topping comes out clean, about 20 minutes. 6. Sprinkle the cheddar cheese on top of the corn bread evenly. 6. Let rest 20 minutes before serving and the cheese is melted.